In planning our trip to Las Vegas, we did an outline of shows we wanted to see. Unless you are going with just the express intent of drinking and gambling, it is a good idea to have a game plan. 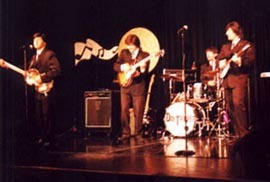 While we were looking over the acts playing Vegas, Day Tripper was brought to my attention. Of course being a Beatles-fanatic of the 12th degree (having made the pilgrimage to Liverpool, had a private tour with Allan Williams and had my photo at Strawberry Fields and Abbey Road etc.) - I had to get my Beatle fix while in Vegas. Beatle tribute bands are probably only second to Elvis in the sheer number of impersonators. I always enjoy seeing a Beatles tribute band, no matter what the level of expertise. It’s fun to note the many nuances of each act and what they emphasize. Some put heavy emphasis on authenticity, using the EXACT instruments, amps, clothes, etc. Other tribute bands go to extreme pains to re-create the sound exactly as it sounds on record, even going to the extreme of using live studio gimmickry to achieve this (this seems like a type of fraud to me, but that's a whole nuther topic!). Day Tripper finds a happy medium in their act. Not all the instruments/amps are authentic, but enough to achieve the proper effect. But, where this band excels above allot of other Beatles tribute bands is in their interaction with the audience! I saw them two nights in a row and while some jokes were repeated, the Day Tripper act is not strictly scripted! Not bad for a band that's only been together for 2 months! But, for more on that story, read our interview with the band (link at the end of the live review). I've been watching Beatles tribute bands since about 1989, so its cool to see the changes that technology has brought to the medium. On each side of the stage were two large video screens. This helped to occupy the time between the band's costume changes. 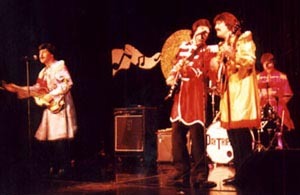 Day Tripper basically covered three stages of the Beatles career: the touring years (with the stage suits like on Ed Sullivan), the Sgt. 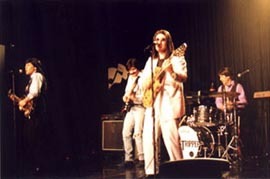 Pepper years (with the satin uniforms) and the later-years (around the time of the "Hey Jude" promo film). The lights dimmed and the video screens started with black and white footage of various fan interviews. Then the classic Ed Sullivan intro led into the first song, "All My Loving". There were a few inaccuracies equipment wise with Peavey amps and no Rickenbacker 12 strings, but like I said, Day Tripper more than compensated for any of these discrepancies. They proceeded with flawless vocals and note-for note versions of "All My Loving", "She Loves You" and "I Want To Hold Your Hand". "John" and "Paul" had the mannerisms of the real Beatles down the best. Paul hams it up with the audience just like the charm of the real McCartney, while John's arrogant, gum-chewing, loosened-tie stance by John is very convincing! For the intro to "I Saw Her Standing There" Paul encourages the audience to "clap their hands and stomp their feet" and of course John does his classic "spastic" routine! I never get tired of this routine when done correctly. John introduced the next song, "A Hard Day's Night" by asking the crowd to try "tearing the roof off"' of Gilleys (a copycat club in the same building named after the famed Houston Country/Western bar). This is the only song where the absence of an authentic 12-string guitar was noticeable. That opening chord has gotta be played on a 12 string! But, "Harrison" didn't play a twelve string Rick, instead playing an Epiphone (correct on the 1966 tour, but not the early stuff). (Note: The second night that I saw Day Tripper, a couple came in late at this point. John pointed it out saying, "you're late, here's what you missed..." At this point they did a few bars of each song in the set leading up to "A Hard Day's Night". This was all done very much in classic Lennon character to great effect!) Two more songs, "I Feel Fine" and "Help" followed before the first costume/break. The video screens played a short snippet of "Tomorrow Never Knows" set to psychedelic images. Then, the Pepperland intro to the "Yellow Submarine" film started, jumping into the "Eleanor Rigby" sequence of the film, but synced without vocals. The band re-emerged in satin Sgt. Pepper regalia, starting into "Sgt. Pepper" and then "With a Little Help From My Friends". Bobbee did a more than passable version of Ringo, not only matching his voice on the song, but his live drumming mannerisms as well. Then came one of the highlights for me, a song that you don't see many Beatles tribute bands play, "When I'm 64". At one point, John dances and flashes the audience during the song. (this is humorous since Lennon HATED dancing!). Next came "Strawberry Fields Forever" and I was totally blown away by Bobbee's drumming on this song- it was superb! (funny note: second night John's mustache came off during this song, which John used to good effect when he sang the lines, "nothing is real and nothing to get hung about"!) "Penny Lane" followed, with John playing the "alternate" notes at the end…again, this is another subtle nuance that makes the band stand out. Little clever attention to small details can go a long way! Especially for the diehard fan. The band took another costume break while the video screens showed Elvis doing a version of "Something". The band entered in their late-period garb, John all in white, Paul & Ringo in vests and George in denim (but with holes in the knees...I thought that wasn't popular until the Ramones?) The band covered note-perfect renditions of "Come Together" and "Back in the U.S.S.R." They then played a seldom played (at least by the tribute bands I've seen) Beatles song, "Ballad of John & Yoko". Again, not playing just the standard and expected Beatles classics sets you apart. "Revolution" was next and then Paul announced that he would like to introduce the band. John, George and Ringo proceeded to shake hands with each other in another funny parody. Announcing their last song, everybody was on their feet clapping during "Twist & Shout". Overall, I would say the band deserves your attention should you make it to Vegas. Whether you are the casual fan or a diehard like me, you won't be disappointed. I just can't wait to see them next year when they've had 14 months of playing under their belts.